Campaigners spend years trying to change public opinion. They organize rallies, publish reports, set up photo ops, and cross their fingers it’ll make a difference. It turns out there’s a simpler way: get Donald Trump to oppose whatever you want. On issue after issue, the best thing to have happened to progressives looking for public support is for Trump to have come out against them. 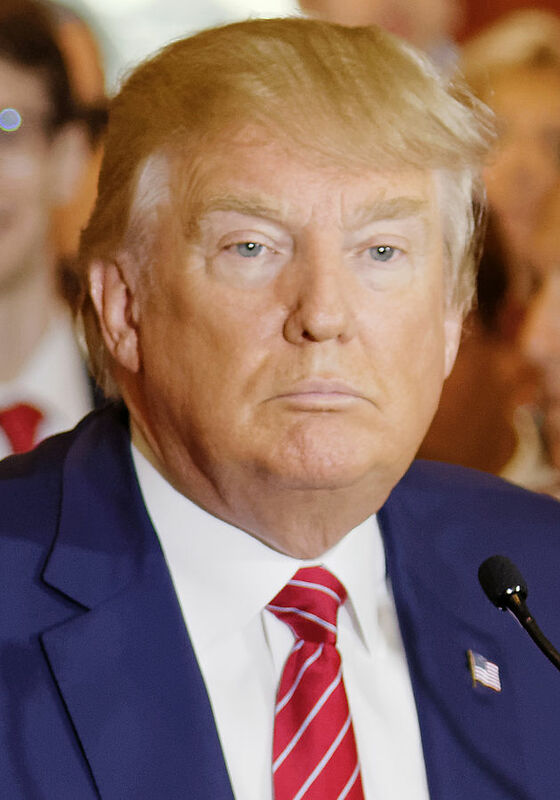 From climate change to foreign trade and from equal marriage to the death penalty, whatever Trump thinks, the US public are concluding the opposite. He is making America liberal again. 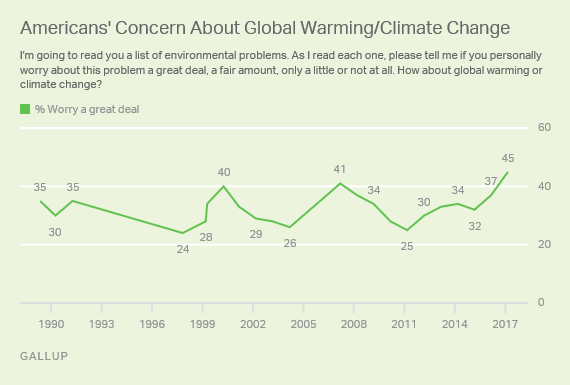 Stopping climate change, which Trump has said is a Chinese hoax: more Americans are greatly worried about it than at any point in the last 30 years. Abolishing the death penalty, which Trump recently called to be used in a terrorist case: support is at its lowest level since 1972. Keeping Obamacare, which Trump has repeatedly tried to abolish and sabotage: more people support it than oppose it for the first time. Welcoming immigration, which Trump wants to restrict: the view immigrants help the economy is at a record high. Liberalising foreign trade, which Trump is undoing: record numbers now see foreign trade as an opportunity rather than a threat. 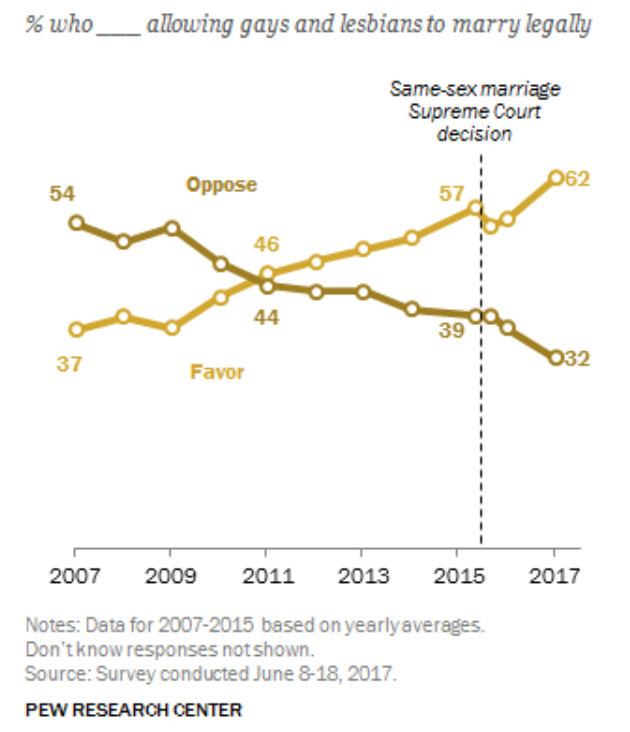 Allowing equal marriage, which Trump has suggested he might block: support is at a record level. Being wary of Russia, which Trump doesn’t seem to be: a (joint) record number now have an unfavourable view of Russia. Encouraging women to be managers: Trump is very male and, famously, the boss. Americans are increasingly doubtful of that combination. Honestly, I don’t really think this is all because of Trump. Let’s give Paul Ryan some credit too. And, yes, most of them have been trending in that direction for years, part of long-term social shifts. The recent movements look like jumps in the way they were, generally, already heading. But, still, there’s nothing like a historically unpopular president, with strong opinions and a loud voice, to make millions of people reconsider their own views. My book, The Climate Majority: Apathy and Action in an Age of Nationalism, is published by New Internationalist. Worries about climate change are at record levels. Is this a new chapter in public opinion? Posted in Climate Sock, U.S. on March 16th, 2017 by Leo – Comments Off on Worries about climate change are at record levels. Is this a new chapter in public opinion? Public opinion is rarely tidy but sometimes there are clear trends in the popular mood. A new poll suggests there has been a shift in public opinion about climate change, with a surge in worries about the threat. The new poll – of the US public, by Gallup – suggests we may be in a new stage. Concern about climate change appears to have past 2009 levels and to now exceed all previous peaks. Is that a justifiable conclusion? A problem is that this is just one poll. It’s the only one I’m aware of that shows concern to now be greater than it’s ever previously been. It might be a rogue result, outside the margin of error. But… It’s 8-points up on the previous year’s poll, and 4 above any previous. This poll would have to have been a real statistical fluke for the true level of public concern not be the highest since at least 2009. And a different poll, from the UK, suggests something similar. Various people have asked the “is climate change real” question (FWIW, I don’t like the question – it’s confused by political identity and doesn’t reflect what people actually want done about emissions – but these results are so striking I can’t ignore it). Since 2009 responses to this question were uncannily static. But in February this year ECIU’s poll showed a sudden jump. So that’s more evidence that we’ve started a new chapter. Yet I’m still not sure it’s definitive that worries are at record levels. We can probably say concern about climate change is greater than it’s been any time since 2010 – in the US at least – but there’s not enough evidence to be sure it’s at the highest level ever. 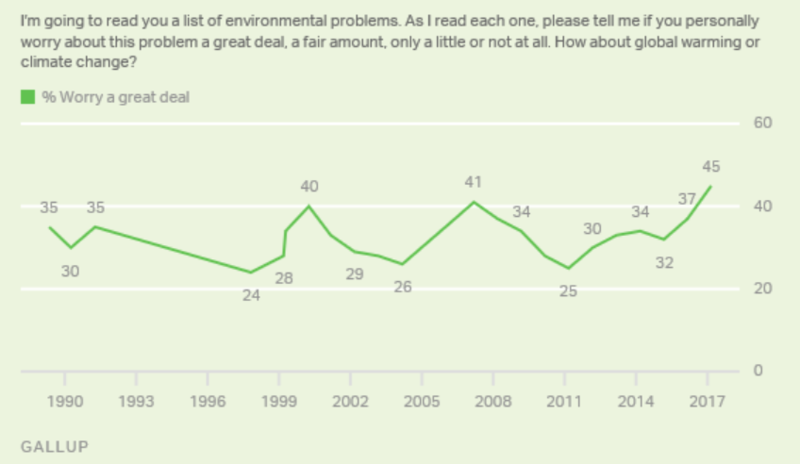 One issue is Gallup’s chart shows only the percentage that worry a great deal about climate change. In the equivalent chart last year they combined it with those that worry a fair amount. If we do the same for this year’s data, we find worries this year are no higher than they were in 2008 and are still lower than they were in 1999-2000. So if we’re still, if not on the fence, at least within touching distance of it, what more evidence might persuade us that worries really are smashing records? In the UK, the government’s quarterly climate and energy poll asks a question once a year on concern about climate change. The question uses the same wording that MORI has run since 2005, giving a nice comparison that will allow us to test the theory. The next wave, due to be published in late April, should ask that question, so we’ll have more evidence soon about whether concern is rising. And in Australia, the Lowy Institute has run the same climate question since 2006 in its annual poll. The next wave should be out in June. In both that and the UK poll, concern in 2016 was still some way below the pre-2010 peak, although the highest for a few years. I wouldn’t be surprised if this year’s data shows worries are up but not yet at record levels. Putting it together, the evidence is clear that worries about climate change have been rising for several years. Last year concern was around where it was in the late 2000s. This year, either worries have stopped increasing or they’re moving towards record levels. It may be too early to say for sure but the initial evidence suggests concern is still rising. His overall victory wasn’t much bigger than last time, 62% compared with just under 60%. 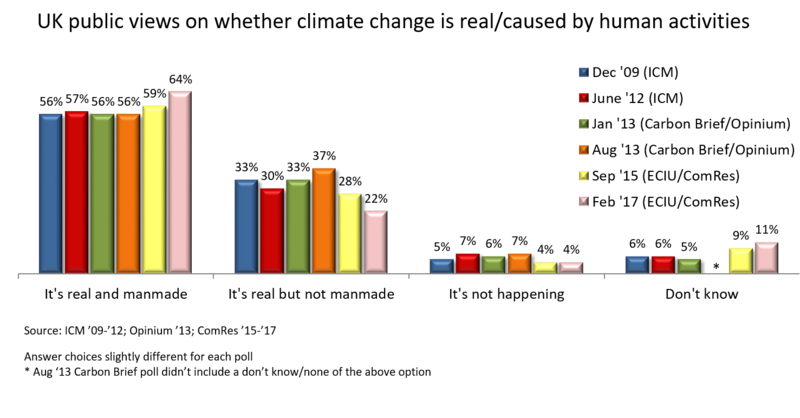 But there was a significant increase in his win among the members, from about 50% to close to 60%. This was partly about people who voted for Burnham last year, but is mostly about a change in the membership. Smith won nearly two-thirds of people who had joined Labour before the last general election, while Corbyn is utterly dominant among more recent members. The party membership has changed and is much more pro-Corbyn – although this had little to do with the leadership challenge. 1. He won 70% of registered supporters, who paid £25 to vote. It has to be expected that Momentum will try to register those people as full party members, which will mean the membership will become even more sympathetic to Corbyn. 2. As I’ve argued before, around a quarter of people who voted Corbyn last year were shakeable in their faith. They would prefer a leader who could win an election to one who they agree with about everything. The size of his victory among members suggests to me that he’s won many if not most of those people (my view in May was, they needed Corbyn to be given longer before they were persuaded he had to go). Having made the decision to vote for Corbyn this time, they’re now pyschologically committed to him and it’s going to be harder to shake their support in future than it would have been if there hadn’t been a challenge. The Tories are the next-most placed in those positions, and still only 40% put them there. This may be beginning to show: the Lib Dems have been winning local council by-elections in the last few months, when every other major party has had a net loss. But their voting intent score is still as bad as it was a year ago and only 22% say they’d even consider voting Lib Dem. The party has to resolve this contradiction, somehow persuading far more voters that they’re in the same place. 1. Hardly anyone outside politics hears about the Lib Dems any more. It’s much easier to get people’s attention as a small party if you make radical protest noises: Iraq, tuition fees. It’s much harder to do that if the space you want to occupy is, essentially, Blairite. They’ve tried this with the EU, and Farron has made his appeal to ’97 Labour voters explicit, but this doesn’t seem to have made much difference yet. It’s much more difficult to come up with dramatic announcements that will allow people to understand what you stand for if you want to present yourself as responsible modernisers. 2. They may not have the members and MPs for this. I don’t claim to be an expert on the membership of the party, but after 13 years of positioning itself as a left-liberal alternative to New Labour, I’m not sure how much appetitie there is for a reversal. That said, 5 years in coalition may have shaken up the membership on that front. But even if Farron wanted to become the new Clegg (and his instincts are clearly to the left of Blair’s) I’m not sure how much people in the party yearn to be a boring party of the centre. I talked about this and the US election with Keiran and Matt Shaddick from Ladbrokes. Podcast and video below. Polling Matters: the doctors’ strike, Trump & can Owen Smith win? Posted in Labour leadership, Polling Matters, U.S. on September 10th, 2016 by Leo – Comments Off on Polling Matters: the doctors’ strike, Trump & can Owen Smith win? ..and then Keiran explains why his trip to America makes him think that Trump could still win. I was on Polling Matters again this week with Keiran and Rob, talking Theresa May, past Prime Ministers and the US election. I was on Polling Matters again this week, talking about the significance of turnout in the EU referendum, the state of the US races, and political spread betting. Mike Smithson was in the chair while Keiran’s on holiday. I was on Polling Matters this week, talking about how Trump compares with Hillary in national polls; the impact of the Budget on Osborne’s chances of becoming Prime Minister; and the significance of polls that are putting Labour level with the Tories.